I've missed several days in my 100 day challenge - not enough hours in the day....can you relate?? I'm not going to let it stop me. My plan is to catch up over this next week. Looking for quick and easy, but not willing to settle for an ordinary card? Check out the Tin of Cards Kit in the Annual Catalog. There is a coordinating stamp set. Love this stamp set and really thrilled that everything is prepped and in one place! So here's the first card I created, just followed the directions! 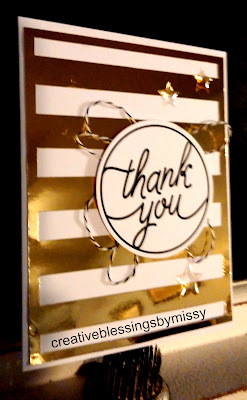 This is a WOW Thank You Card!!! And it is in the mailbox! Card 11 complete on Day 19 All 10 other cards are on my facebook page or check out my Pinterest page to see them all! Stop back tomorrow for another card from this kit! You can order 24/7 on my website!